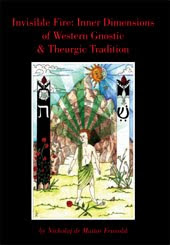 Invisible Fire explores Western esoteric traditions with quite profound implications, revealing the true 'inner tradition' within Western Magical lore for the first time and drawing upon an array of highly arcane sources and teachings within the Gnostic and High Magical streams inherited from the Middle Ages and antiquity. The book is written from a traditional perspective as reflected in the greater mystery of Seth. Seth being the vehicle for the angel Raziel, the divine secret, reveals within veil upon veil how true tradition remains as a silent and reference of sustenance for the world. Seth was given the celestial secrets and thus the mystery of all possibilities prior to its manifestation, the very secret of how to understand creation. The Holy Spirit that gives the flame of prophecy and dreams marks the presence of the spirit of Seth. Given the transcendent perspective the book will dazzle as it widens the horizon of possibilities from the all possible.